Communication Objectives: This lesson will teach kids to count from 1 - 10 and to ask to give information about numbers. Language Objectives: To learn to use numbers to describe things. 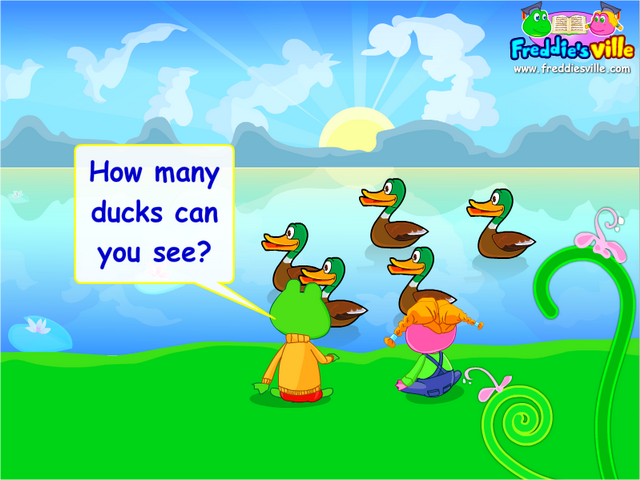 This lesson will also help kids learn to ask questions about numbers using the 'How many..?' question format. Dialogue Story: Freddie and his Lisa are sitting by a lake when out of the blue ducks appear on the lake. As the ducks appear one after other, the temptation of counting them is irresistible. How many ducks can you see? I can see many ducks.